Treat your guests right with Bacon-Wrapped Jalapeño Peppers. 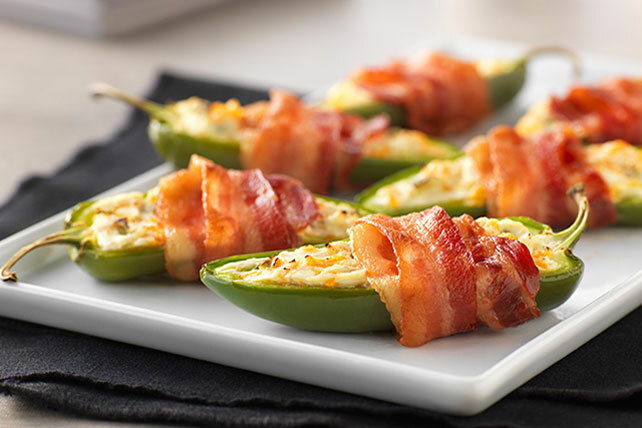 Bacon-Wrapped Jalapeño Peppers are (in our humble opinion) creamy, crispy, spicy and yummy. Combine cheeses; spoon into pepper halves. Wrap with bacon, overlapping edges as necessary. Place, filled sides up, in shallow foil-lined pan. Bake 17 to 20 min. or until bacon is done. Cool slightly before removing from pan to serve. For best results, tuck ends of bacon under peppers when placing in prepared pan to prevent bacon from unwrapping as it cooks or use toothpicks to secure. Prepare using PHILADELPHIA Garden Vegetable Cream Cheese Spread. Or, prepare using PHILADELPHIA 1/3 Less Fat than Cream Cheese and KRAFT 2% Milk Shredded Sharp Cheddar Cheese. When handling fresh jalapeño peppers, never touch your eyes, nose or mouth, additionally you may wear rubber or disposable plastic gloves when seeding them.